COPYRIGHT © 2016 ESTHETICS INTERNATIONAL GROUP BERHAD (408061-P). ALL RIGHTS RESERVED. Physicians Formula products care for sensitive skin with glamorous solutions for the specific, yet common skin problems that women face every day. Gentle, safe yet effective, exciting, eye candy…this is the brand promise to solve every woman’s makeup needs and reveal their most glamorous self. Watsons Personal Care Stores (Malaysia) Sdn. Bhd. is part of the Health and Beauty Store chain of A.S Watson, the largest health, beauty, cosmetics and perfumery retailer in the world. With its strong retail expertise, EIG and Watsons strive to bring healthy and glamourous beauty solution to Malaysian consumers. Physicians Formula is now available exclusively at selected Watsons Malaysia outlets. The price ranges from RM39 – RM82. Clinelle made its first appearance in 2004. Since then, we have expanded our brand distribution network through chain pharmacies, independent pharmacies Malaysia and Hong Kong. Growing through the years, Clinelle has created its professional products using an integrated Envinix system to free skin from rapid internal and external environmental aggressions that affect skin immunity. With RX3 Action to Repair, Refine and Reshield skin for optimized skin health. All Clinelle products are dermatologically tested for its tolerance and also formulated with 6 secrets to happy skin which excludes potential harmful ingredients: No artificial colouring, No artificial fragrances, No lanolin, No mineral oil, No SD-alcohol and No comedogenic ingredients. Clinelle and Ms Ella Chen 陳嘉樺, one of the members from the famous Taiwanese girl pop group S.H.E, have come together in the latest addition to Clinelle’s ground-breaking whitening innovation, WhitenUp. Ella’s down-to-earth, energetic and jovial personality beautifully personify what Clinelle stands for – “Happy Skin, Happy Face”. Clinelle has appointed Shima Anuar, a young and uprising Malaysia artiste as its new brand ambassador. Shima Anuar is the ideal person to express Clinelle’s brand philosophy and natural beauty. Her sparkling personality, unprecedented talent and commitment to her work exemplify the modern day women. Together with her natural beauty, Shima can’t wait to connect with consumers and sharing her personal experience using Clinelle products. EVO® is an innovative, professional hair and beauty product manufacturer with individuality and integrity; a manufacturer that speak the truth. 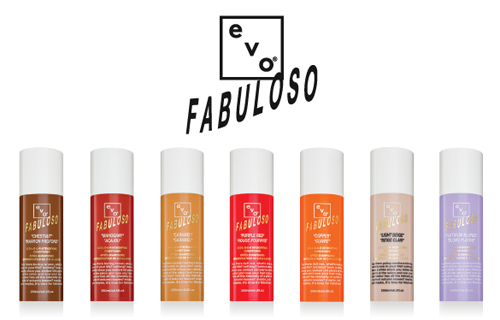 Inside bottles of evo® that are bursting with personality, you’ll find luxurious products that are sulphate, paraben, dea, tea and propylene glycol free; products that give professional results while respecting the environment. You won’t find unnecessary, over-marketed ingredients; no imaginary technology, no myths, no gimmicks. All ingredients in evo® formulations are active; nothing is added only to make claims on the label. Evo® can cater for every hair salons’ needs – supplying the finest quality hair care products, education and professional service. Founded in Parma, Italy in 1983 by the Bollati Family, Davines is one of the leading professional hair care brands sold across thousands of salons in more than 80 countries worldwide. Since the beginning, Davines has focused on crafting authentic quality products that are scientifically engineered to work and express Davines’ distinctive style and spirit. Quality to Davines means having the freedom to create the best products with attention and respect for our environment, using high grade, natural ingredients, and applying scientific rigor to every product to guarantee customer safety. Rather than conforming to the mainstream, Davines believes in the freedom to develop concepts and products that are original, authentic, and emotionally connected with people. The work is a thoughtful balance of substance and style, nature and science, people and spirit. This enables Davines to create what is called life-enhancing projects. Vitalzyme is a refreshing and tasty daily enzyme drink with a 100% natural blend of 120 fruits and plants. Combined with more than 54 types of friendly bacteria, each serving will provide you an array of potent antioxidants, organic acids and phytonutrients for daily wellness. It contains no alcohol, no pesticide, no preservative, no artificial coloring, no artificial flavoring and no added sugar. Armed with over 30 years of experience in the 180-day triple fermentation technology, Vitalzyme preserves the goodness of traditional, old-time methods of antique cypress barrels, while improving the quality of the enzymes with modern Japanese technology. Each 15ml serving contains an amazingly high level of antioxidants. Everyone! Vitamins and minerals mean nothing without the labor force of enzymes. The chemical reaction from enzymes helps cells to build and break down molecules quickly while strengthening the immune system and slowing down the aging process. * Superoxide dismutases (SOD) are essential enzymes that elimate superoxide radical (02-) and protect cells from damage induced by free radicals. The endermologie® technique arose from research on tissue therapy, treating scars, burns or edema and has proven its worth for now 30 years. This natural, non-invasive, non-aggressive method, respectful of the ecology of the skin, rebalances physiological processes to meet the aesthetic expectations that all women have, no matter their beauty concerns: localized excess volume, “orange peel” aspect, lack of firmness, wrinkles, and so on. Thanks to LPG’s patented treatment heads, the endermologie® technique gently stimulates the skin to reactivate dormant cellular activity naturally, painlessly and without any side effects. Awakened, the target cells then metamorphose the skin from within for visible slimming and anti-aging results. The endermologie® treatment is exclusively administered by a trained professional equipped with patented LPG technologies: CELLU M6® or MOBILIFT M6®. Always on the cutting edge of innovation, these state-of-the-art devices guarantee quality endermologie®treatments that respect your skin and offer optimal results. For over 23 years, award winning Tisserand has been the #1 aromatherapy-based brand in the UK and can be found across Europe in 20,000+ stores – from integrative medicine, herbalist shops, and yoga centers, to many fine retailers. Tisserand offers the finest essential oils and authentic aromatherapy personal care products that enhance well-being and enjoyment. Their essentials oils are100% pure organic, wild crafted or ethically harvested and sourced only from known botanical species for maximum fragrance. Tisserand is constantly updating and improving their formula, sourcing and using new ingredient alternatives that are mild to the skin and, wherever possible, organic and kinder to the environment. The right equipment for every environment and every business! Bio-Therapeutic, Inc., the world leader in esthetic technology, was established in 1974, and is headquartered in Seattle, Washington. With a firm belief in advancing skincare technology, Bio- Therapeutic has repeatedly revolutionized the skin care industry with their cutting edge, non- invasive, and age defying equipment and award winning products including the bt-PRO® line, bt- accent® line, bt-GEAR® hand held technology, and the bT-Ceuticals® advanced product offering. Youngblood® is a premier luxury mineral cosmetics line made in California, USA from natural, finely ground minerals from the earth, without common irritants (including chemicals, dyes and preservatives) found in conventional makeup. Created by a paramedical aesthetician, Pauline Youngblood, in 1996, many of the Youngblood products contain Youngblood’s signature blend of minerals including Malachite, Rhodolite, Hematite and Zincite to help protect cells and tissue. Youngblood® is gentle to all skin types and conditions, including skin recovering from laser or chemical peels, or experiencing rosacea, acne or discoloration. Truly understanding your skin is the first step towards skin health for a lifetime. 1)	Professionally certified skincare therapists. 2)	World-leading skincare and wellness products incorporating cutting-edge technology. 3)	Strategic locations with close to 80 outlets where are convenient for our customers. AsterSpring’s bespoke skin health management programs personalize to every individual’s skin needs have helped more than 10 million faces regionally to achieve their skin health goals. You can always trust us to help you achieve optimal skin health.